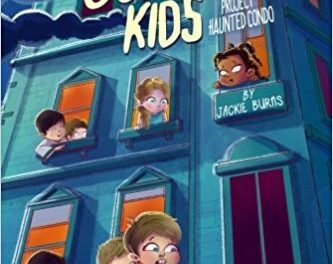 Katherine Kommer plans baby showers and children’s events in New York City! We sat down with this talented Baby Shower event planner to get all the details on what it is like planning such an important event for NYC Moms! 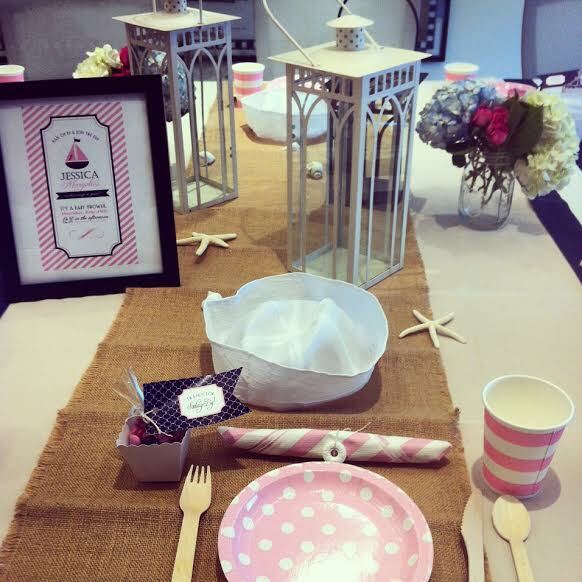 Find out some of the current Baby Shower trends and themes she has created! How did you come up with the idea of Baby Showers Inc.? I started out event planning while working at a hedge fund in NYC where I organized and managed a variety of corporate events. Several of my co-workers had become pregnant over the course of my career there and I was given the opportunity to throw each of them an office baby shower with extravagant budgets. I’ve always had a passion for design and incorporating personal style to any event. Planning these baby showers was extra special and exciting for me since I was able to use my creativity to produce events with a little more character, catering to the personalities of the moms-to be. I received so much positive feedback that I realized this was something I wanted to pursue full time and develop baby shower planning into a successful business. How does an event planner help with planning a baby shower? It can be a daunting task to organize and manage all the details of planning a baby shower. An event planner will ease the stress of this process by handling everything from custom invitations and décor to catering and entertainment while maintaining a budget. Working with an event planner is also key in creating and designing a unique theme for a baby shower, giving each memorable event for the mom-to-be and her guests a personal touch. Whether the client needs planning service from start to finish, a day-of coordinator or just some guidance in getting started, an event planner will ensure that your baby shower will be a success! What happens during a baby shower consultation? The first step to planning a baby shower starts with a consultation with the hostess, usually a good friend or family member of the mom-to-be. During the initial consultation, we ask our clients to provide some basic information about the event, covering all the logistics. One of the key elements we find most helpful in generating a more personal event is getting to know the mom-to-be so we can create a unique theme, incorporating her own individual style and personality. Once we gather this information then we take the time generate a detailed proposal including all elements of the event from start to finish. 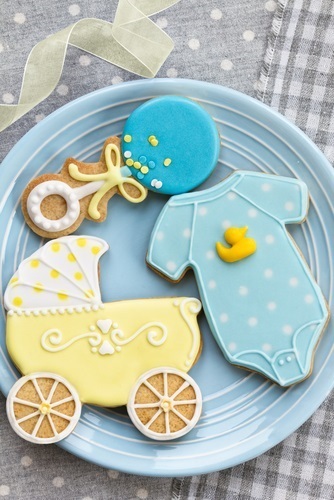 What are some fun themed baby showers you have helped plan? 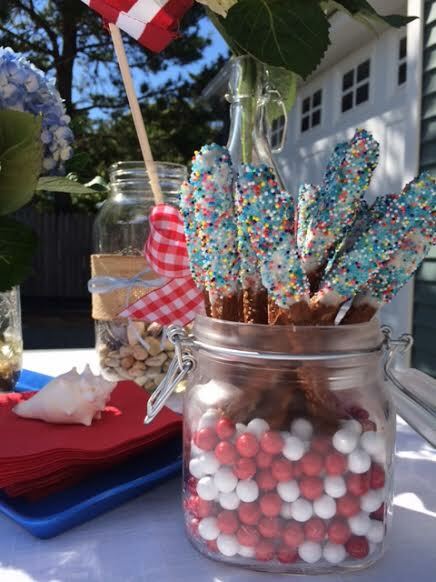 We’ve planned a few cute nautical and patriotic themed baby showers this year, which are always fun during the summer months. 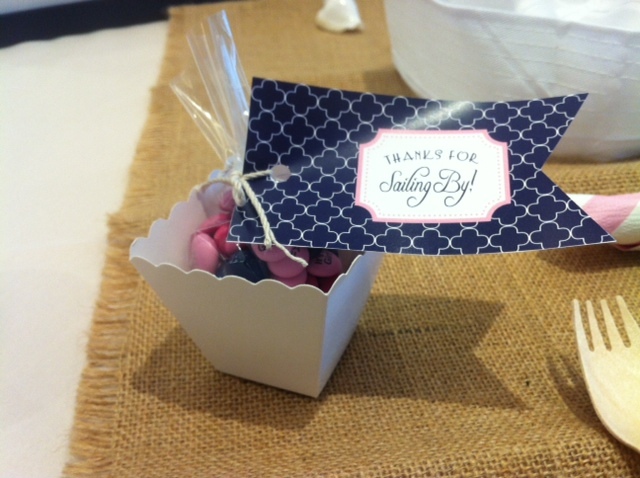 A recent favorite was a ‘Cute as a Button’ themed shower. This was actually a corporate baby shower held at an office in Manhattan, hosted by the female co-workers of two moms-to-be. Both of the women were keeping the gender of their babies a surprise so we came up with an adorable, gender neutral theme using a gray, white and yellow color scheme. 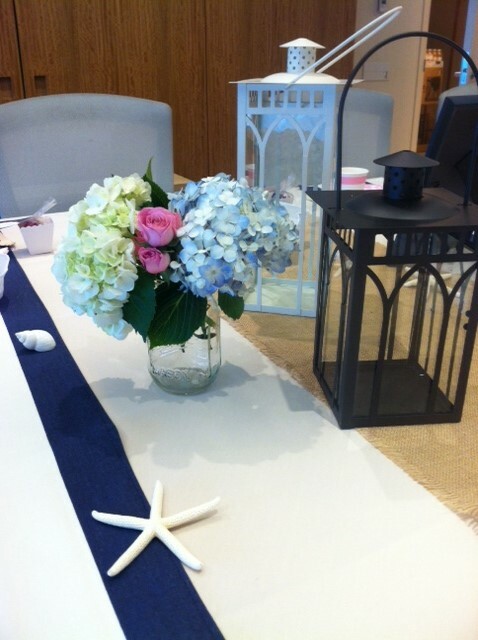 We transformed one of the conference rooms into a beautiful setting, incorporating the theme and color into all elements of the celebration, from the invitations down to the button cookie favors. Are there any trends you are seeing with baby showers recently? Dessert and candy bars have been a big trend in the past few years but recently mocktail bars have now become a popular and creative element in baby shower celebrations. Mocktails or ‘Preggatinis’ are a modern spin on the ordinary non-alcoholic beverage. Even when sporting a baby bump, modern moms can enjoy a refreshing, and chic liquorless libation with their guests. Incorporating the theme of a baby shower in the display, name and garnish of a signature mocktail is a fun, trendy edition to modern baby shower design. Do you do gender reveal parties? Absolutely! These types of parties are especially fun to plan because there is the element of suspense and surprise for the guests. Whether it’s a pink or blue dessert filling, interactive vote among guests or confetti toss, getting creative with planning the ‘reveal’ moment is so exciting! 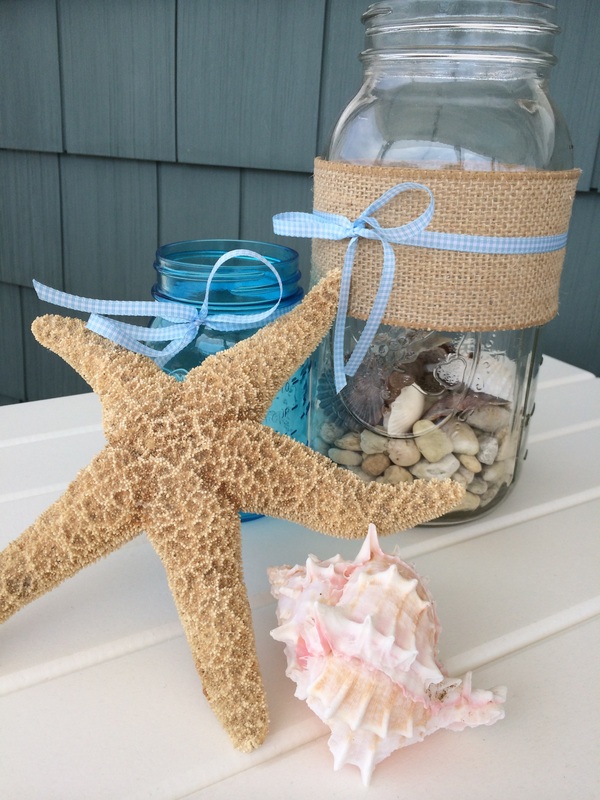 What are your favorite party favors to do for a baby shower? Miniature or single-serving desserts are usually my personal favorite party favor. They can be displayed nicely at a gift or dining table, adding to the décor of the event and can also double as the dessert for the event. 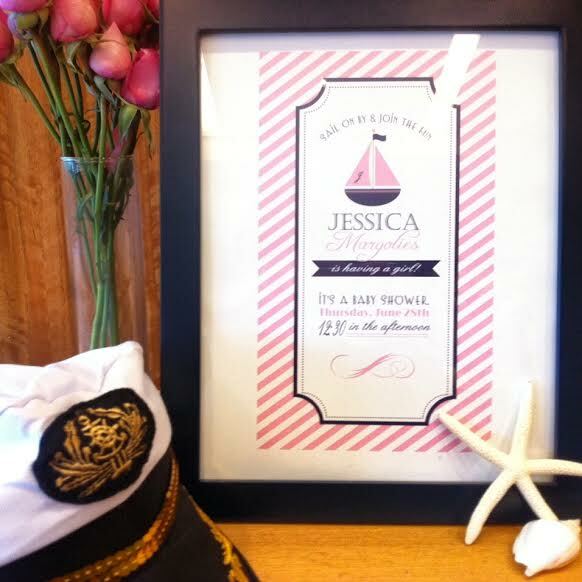 Incorporating the theme of the shower is always a cute idea and complements the attention to detail of the event. Custom cookies, decorative cake pops and personalized candy with themed packaging are creative ways to make unique party favors that your guests will enjoy. How important is it to have an event planner to help with a day of event coordination? There is simply no substitute for an event planner that is on-site and ready to respond instantaneously to any challenge or unexpected issue that may occur the day of your event. A day-of-coordinator will not only ease the stress of the host but also ensure every guest will have a meaningful, unique, and memorable experience. Whether it be serving as a liaison between the host and the many, varied service providers before and during the event or being present to coordinate the setup of your décor, table settings and favors, a day-of coordinator will help manage every last detail. Do you have style consulting for the Mom To Be for her baby shower? Yes! We want the Mom-To-Be to feel confident and fabulous on her special day. Our services include meeting with a maternity fashion consultant to find the perfect outfit prior to the event. Not only does Baby Showers Inc. plan baby showers but they alsooffer professional event planning services for children’s events and other special occasions! I’m speechless! She is such an amazing woman and I have no doubt with that. This woman will surely inspire those aspiring to be a successful event planner. One thing I wanted to say is, she’s impressive!